It can be really hard to get children with health problems to co-operate when it comes to tracking their issues and making small adjustments to their lifestyles. Often tasks that involve talking about their problems or taking uncomfortable readings need to be approached in a whole new way, a way that feels familiar, fun and gives them a reason to really get involved. The Blood Buddy gadget aims to do just that, it’s a blood glucose monitor that effectively pricks a child’s finger and reads their glucose levels but does it in a fun way that hopefully they’ll associate with games and stories. 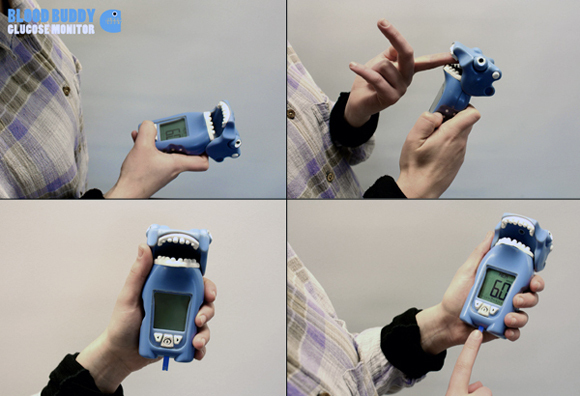 Our only worry is that putting your finger inside a monster’s mouth might be even less appealing than having the test taken normally… But hey, we’re not five, maybe finger-eating-monsters are really cool right now. Regardless of how effective this gadget would be in real life, it’s just good to see new devices are being developed that take a child’s perspective into consideration and will make them much happier about tracking and treating their health issues in the long run.